Those of you who know me well will know that I absolutely adore Mexico. The country is without a doubt one of the most beautiful places I have ever seen but what’s even more beautiful is it’s traditions. 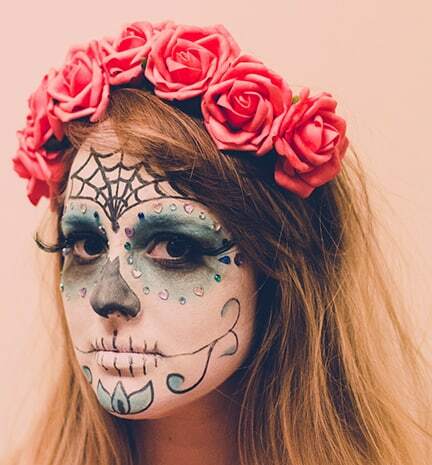 One of my favourites is Dia De Los Muertos better known to us as Day Of The Dead. This is the tradition where the life of loved ones that have passed is celebrated and honored. It normally takes place on November 1st & November 2nd but we often use the makeup for Halloween! Over the course of the first two days in November pictures of the deceased are placed on altars & shrines with that person’s favourite food and drink, they also place candles to light their way home, and soap and water to freshen-up after their long trip. Some display symbols they would understand and gifts are left to communicate to them and let them know that they are always in the hearts of those they left behind, the intent is to encourage visits from the souls. The Mexicans say that The Dia De Los Muertos ‘is a time of joy because we know that we are surrounded by those that we love-both living and dead.’ I think it’s so uplifting and inspiring to see a ceremony that approaches the death of somebody in a different way, a beautiful and touching way! So now you know a little more about the tradition it’s time to learn how to do the makeup! You can either watch our first ever YouTube video below, filmed by the wonderful Just Say Yes Films or you can continue reading to see the tutorial photographed step by step! We’d love your feedback on the video, we’re going to be turning one of our DIY’s into a video every month and if you’d like to keep up then you can subscribe to our channel here! ♥ White face paint ♥ A Sponge ♥ Eye shadow in the colour of your choice ♥ A darker shade of that colour ♥ Black Eyeliner ♥ Emergency Face wipes ♥ Gems ♥ Fake Eyelashes & Glue ♥ Floral Crown (optional) Ours is from Crown & Glory ! Step 1: Cover the face completely in white face paint! Follow it down to the jaw and avoid getting any on the neck. Step 2: Take the lighter shade of your eye shadow and colour in two large circles around the eyes, you’ll want to go just above the eye brows, follow the jaw line down and stop just above the tip of the nose. Step 3: Using your darker shade cover the eye lids and underneath your eyes then take your eye liner and colour in the entire nose, you’ll want to stop on the bridge of the nose creating two sharp points. Step 4: Draw a line from the lips all the way along the cheeks and add two little swirls on the end then repeat on the other side. Next add vertical lines all the way along the lips. Step 5: To create the spider web start by drawing a straight line down the center of the head then branch off with 2 more lines following the shape of the blue circles then fill in the remaining lines. Next draw the flower on the chin by creating 3 tear drops then colour in using your eye shadow. Step 6: Glue on your fake eye lashes. Step 7: The fun part!! Using your eye lash glue stick the gems around your eyes following the shapes of the blue circles. Step 8: Let that hair down and pop on your floral crown! You’re done! How fun is this and what an ace look for Halloween this year! Emily didn’t want to take it off and even drove home with her makeup like this! I wouldn’t of liked to have been Mr T when he opened the front door! Thank you so much for the tips on ‘Dia De Los Muertos’ . The video was great! fun and easy steps !!! I know! It looks great and easy…. Hi girls, can you please tell me where is the best place to buy all of the make-up needed for this ? If I wanted to get it all from one place. Either online or in a shop. Thanks for your advice. Unfortunately this video is now over 3 years old so we would no longer have details on the exact places we bought everything however it was all from the high street, so should be super simple to find. Sorry we can’t be anymore help.